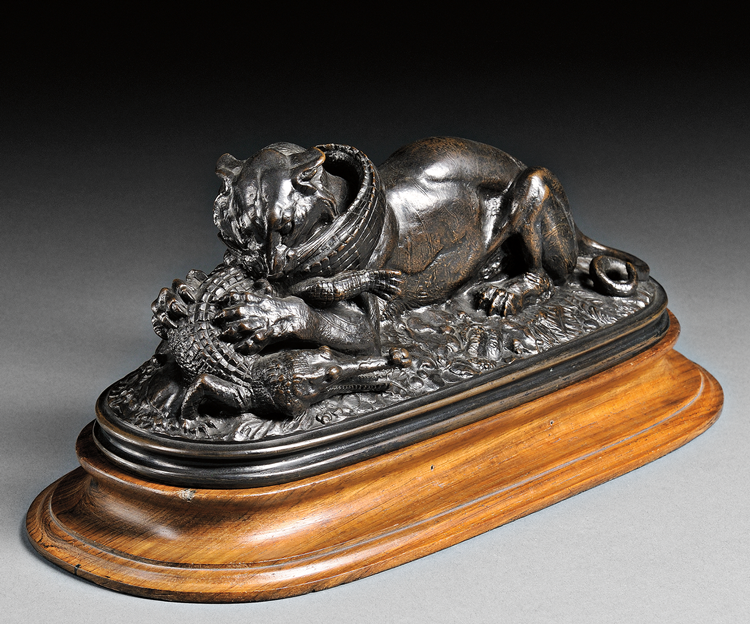 Antoine-Louis Barye | Bronze Sculpture | Tigers, Panthers, Owls | Skinner Inc. The violent, dramatic sculptures of Antoine-Louis Barye draw you in with their tense compositions and meticulous – some might say obsessive – attention to detail. Barye had an innate ability to understand the behaviors and muscularity of all animals, and this served him especially well in his renderings of hunting cats, rearing bears, and stampeding elephants. In Hibou (Owl), I can’t help but be drawn to the charm of this magnificent bird with its wings spread as though it will take flight in the next instance. The small detail of the rat caught in the owl’s talons can easily by overlooked, and for a milk-toast like myself who has trouble watching the violence inherent in a hockey game (I prefer baseball), this is just as well. Barye, however, reveled in the gore; in the destruction rendered by tooth and claw. We all root for the underdog — I’m a die-hard Red Sox fan — but the fight for the underdog only draws us in if there’s at least a small chance of victory. Such is the case in Barye’s Tiger Devouring a Gavial of 1830. Considered one of his most successful compositions, he showed it in the Paris Salon, where it was purchased for the Luxembourg Gardens, and is now in the Louvre. Although the gavial is clearly in an “underwater” position, the outcome of this tense and violent scene is not fully determined, making the composition all the more climactic and riveting. The tiger’s grip with teeth and claws seems unassailable; the claws actually penetrate into the reptile’s flesh. Yet the gavial swings his toothy maw around towards the cat’s leg, remaining vigorous and valiant up to the very end of the fight. Barye’s Panther Seizing a Stag depicts a similar level of violence, but here, at least to me and other 21st century observers, the violence seems all the greater as the victim is no longer an unfriendly crocodile-like reptile. 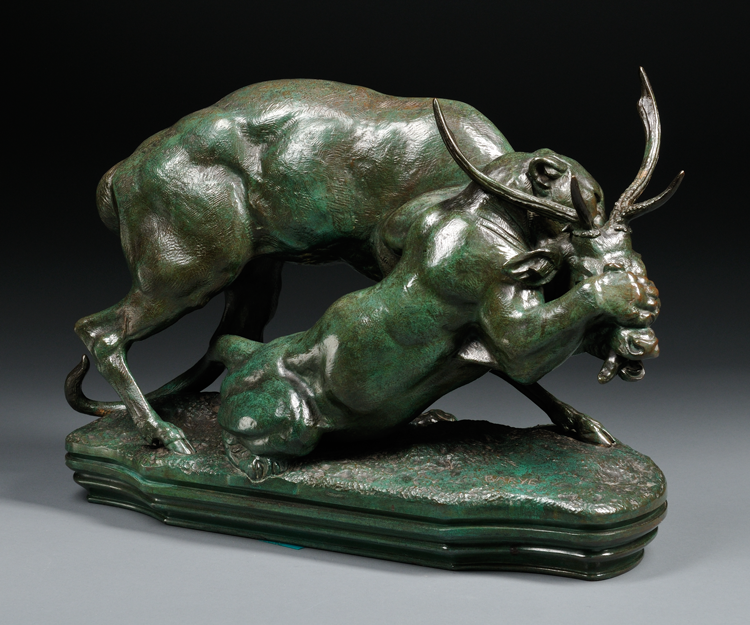 Antoine-Louis Barye, Panthère saisissant un cerf (Panther Seizing a Stag), bronze. To be auctioned on September 7, 2012 in Boston. All the stag can do is kick and collapse onto his attacker, as the panther pulls the muzzle of his victim to the ground with an enormous paw, while trying to break the stag’s neck with a vice-like bite directly behind the stag’s antlers. The outcome in this battle is nearly certain, even if we do hope for a miraculous escape for the stag. In spite of the horror of these violent bronze sculptures, they are still beautiful and riveting. We still stare. We still watch. I continue to watch baseball even now, when the Red Sox find themselves under 500. In baseball and in art, it’s hard to look away when the outcome is uncertain and possibly dire. I am much more optimistic and excited about presenting these works at our next Paintings & Sculpture auction. On September 7th, this group of Barye bronze sculptures will be sold at auction in Boston. For that week, at least, I’ll take a break from baseball. Join us for the free public preview September 5th through 7th. 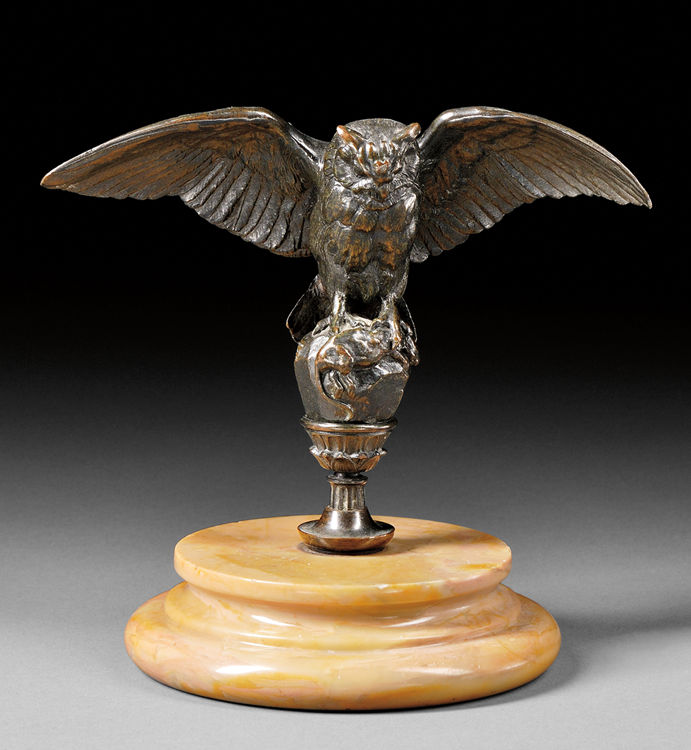 This entry was posted in Blog and tagged Antoine-Louis Barye, Art & Antiques, Barye sculpture, bronze sculpture, bronze sculptures, bronzes, Fine Paintings, History of Art & Antiques, owl, panther, robin starr, sculpture, tiger by Robin Starr. Bookmark the permalink.